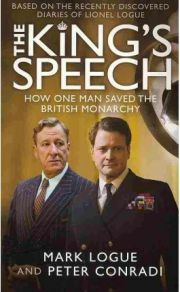 The King’s Speech by Mark Logue and Peter Conradi is about Australian speech therapist Lionel Logue, the man who helped King George VI overcome his stammer. It accompanies the recently released film of the same name, but it is not a novelisation, nor is it the book the film was based on. Mark Logue is a grandson of Lionel Logue, and in his introduction he describes his quest to learn more about his grandfather, and also his reasons for wanting to tell his story. While the film covers only a decade or so, from 1926 to the start of the Second World War in 1939, Mark Logue wanted to provide a fuller picture of his grandfather’s life, from his life in Australia right through all the years he worked with and became friends with the King. I was keen to read The King’s Speech, and see the movie (although I haven’t yet! ), because of my interest in royal history. I read a biography of George VI’s wife not long ago, Queen Elizabeth the Queen Mother, and the period of time when they were on the throne, and how they got there, is quite fascinating. While the focus of The King’s Speech is on the relationship between Logue and the King, and the speech therapy, we are by necessity given a much broader picture of both. The book gives a reasonably in depth biography of Logue prior to his first meeting with the King, which enables us to learn more about this rather determined man. A short biography of the King is also included, which is also necessary because without it we would know little of his character or his childhood, as of course the authors can’t assume all their readers will know this already. The King’s Speech gives a fairly personal portrait of King George VI, thanks to the nature of the relationship he had with Logue. While it began as a professional relationship, with Logue insisting the then Duke of York visit him at Harley Street, it grew into a friendship. The King relied on Logue’s support for many years, and was relaxed and informal with him, although Logue was always very respectful and admiring of the King, and somewhat in awe of Queen Elizabeth, and the King’s mother Queen Mary. One wonderful example of the relaxed nature of their relationship comes on VE Day, when the King “plaintively declares” to Logue that “if I don’t get dinner before 9, I won’t get any after, as everyone will be away watching the sights”. This statement coming from the King, a man in such an “exalted position” has Logue laughing madly, and is a very sweet view of George VI concerned about getting his dinner. There are other such incidences reported in the book, and all bring a smile. This is not an in depth historical book, so would not be suitable for anyone looking for a biography of King George VI. Rather it is a fairly short book, and although it does include some major historical occasions (the death of George V, the abdication, and the Second World War), these form the timeline of the story rather than the story itself. Of course these occasions are all very important in the relationship between George VI and Lionel Logue, as they were all high pressure and required the King to speak in public. The King’s Speech is an enjoyable and interesting book, and while it may not be an in depth historical text, it gives a fascinating insight into the life of King George VI, and, of course, of Lionel Logue himself. Having read an official biography of the Queen Mother, I enjoyed the personal touch that The King’s Speech added to the story which I already knew. Many letters, comments and events were put into context, and background to the King’s speech therapy was added. The King’s Speech would serve as a lightweight introduction to the monarchy during this period, or as an enjoyable companion to heavier texts. Many thanks to Quercus for providing a review copy of The King’s Speech. No Comments on "The King’s Speech"